One of the projects we have embarked on with the help of Natural England, is to recreate some of the ancient mosses that would once have been common in this part of the country. Moss was the term used in Northumberland for swampy ground. Though much of our better land is currently on the low ground, in the past, the valley bottoms would often have been impassible in wet weather, and much of the worked farm land would have been on the slopes which naturally drained (augmented, in many cases by rig and furrow). Over the past 2-300 years, much of the low land has been drained. Natural Flooding is managed by a series of foot drains. 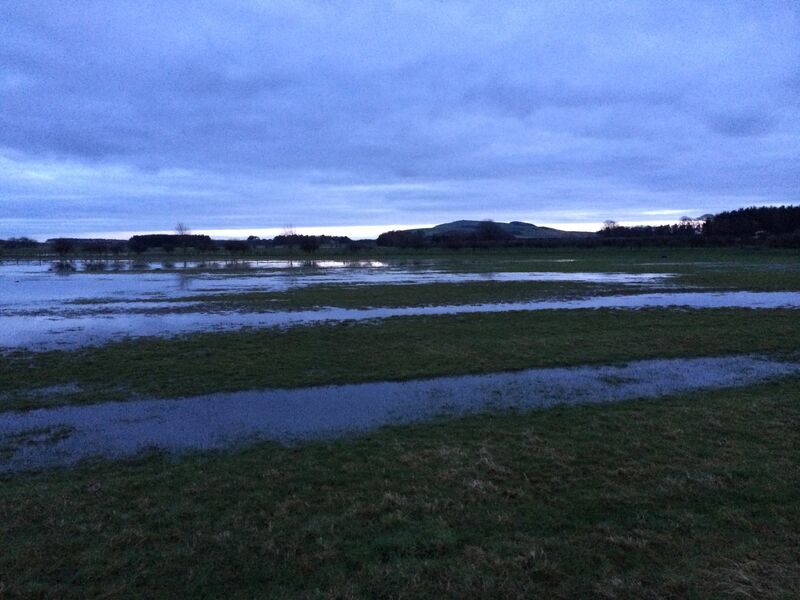 Here at Mindrum we have struggled for some time with the lower fields. Most of these have “moss” in their name (South Moss, Bull Moss, Twinley Moss) and whilst they are quite light, they often flood, and the field drains persistently clog with the fine sand that exists in the valley bottom. About 6 years ago, we were visited by an archaeologist from Newcastle University who had identified a roman camp on Mindrum from Air Photos…. When we put his Maps and Mine together, it became clear that in ancient times, the main buildings (also the camp site) would have been on a gravel Island, surrounded by Swamp on 3 sides and a steep river bank on the fourth. Whilst this made tactical sense, it also made me think. We approached Natural England and after some advice and discussion entered a Higher Level Stewardship scheme where by we now manage our low ground to optimise the flooding . We have taken much from the Romans, and some inspiration from a range of historical practitioners – specifically the Culleys, a pair of brothers farming in the 18th century who designed a scheme for managing water meadows. We have created a series of foot drain matrices, wildlife scrapes and earth sluices which allow us to hold water on the fields, and to let it off in a controlled manner. 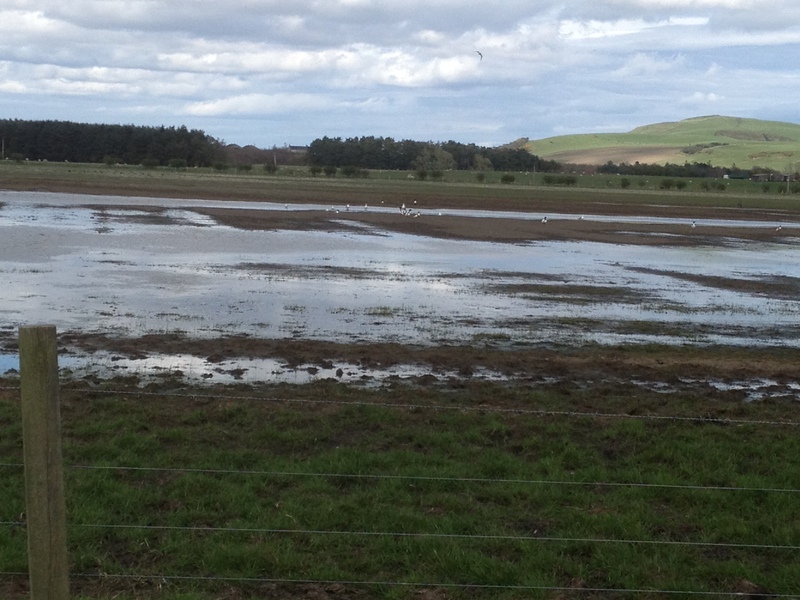 This not only creates a rich environment for water birds and waders, supports the anti flood strategy in place across the River Tweed Watershed, but also enables us to optimise early grass for grazing, whilst leaving meadows lightly stocked whilst birds are nesting. We have learnt a number of lessons from the ground – water has a mind of its own, but now have a relatively mature set of water meadows. From march to June there are significant quantities of nesting waders and waterfowl as well as a range of other birds.